JPEG is one of the most popular and widespread image formats. JPEG pictures are way smaller in size than PNG and other image formats but still have a good quality. Thus, using JPEG images, you can be sure it will be compatible with any device and resource. 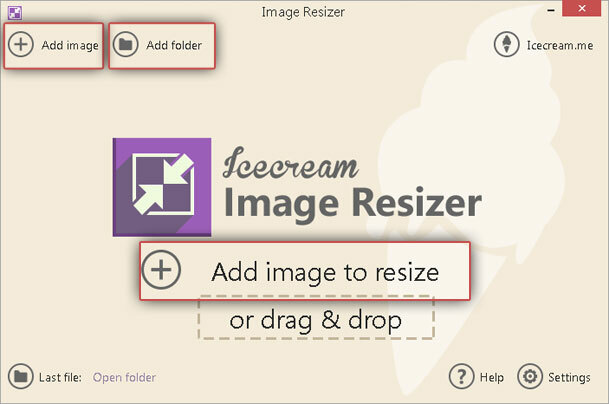 Resizing such a picture is also not a problem, especially if you are using IceСream Image Resizer. Aside from JPEG, the application supports such formats as JPG, BMP, TIFF, and PNG. 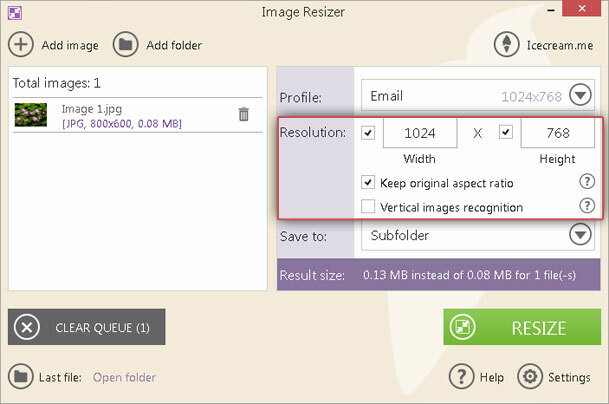 Here is a quick tutorial on how to resize JPEG image in an easy way. First things first: download Icecream Image Resizer onto your computer. To do that, click on the “Download” button on this page and save the setup file. Run it from the containing folder and follow the wizard’s instructions to get the program completely installed on your machine. Launch the app to get started. When you open the program, you will see the main window with a large “Add image to resize” button right in the middle of the interface. Click on it and import an image to resize. Alternatively, click on the “Add image” or “Add folder” buttons at the top left. The first one works exactly like one in the middle of the window and allows you to import single files one by one through Windows explorer (or several ones if you hold Shift or Ctrl). “Add folder” option allows you to import an entire folder with multiple images. If you don’t want to add files from the program using the Explorer of your PC, just drag and drop them in the working area of the resizer. The program only supports image formats (besides JPEG there are JPG, PNG, BMP and TIFF) and won’t recognize files with inappropriate extensions. Before you skip to tweaking the settings, check your file or the queue to make sure you’ve imported the right images. Press the recycle bin icon to the right of the file to delete it or hit the “Clear queue” button to delete all of them. Profile parameters. Profile parameters are available on the right side of the window. There are presets for email, desktop, 320x200, HD 1080 and HD 720, and also the “Manual” option that allows you to set the desired width and height values. Resolution. If you chose one of the parameters earlier, you would see the default values in the “Width” and “Height” boxes. The exception is the “Manual” option – if you chose it, you would be allowed to enter any values you want. Make sure both fields are filled in. In case you want to leave one of the parameters unchanged, just uncheck the corresponding box below. If you want to keep the ratio, check the “Keep the original aspect ratio” box under the “Width” and “Height” fields. You also want to check the “Vertical image recognition” box if you are working with vertical pictures. Save to. Now, you should specify the output location option: “same folder + prefix mini”, “subfolder” or “choose folder”. All of them are pretty self-descriptive: the first one allows you to save the output file in the original folder and adds a prefix “mini” to the file name; the second option creates a subfolder in the original folder and saves an output file in this subfolder; the last option allows you to choose any folder on your computer using the Explorer. On the completion, you should click on a large green “Resize” button at the bottom of the window to resize JPEG image. The popup window will show you a message asking whether or not you want to resize a certain number of images. If you are sure that everything is set up correctly, press “Resize; otherwise, press “Cancel” to add more files or change the settings. Wait until the application processes your files (you can pause/resume or cancel the process for a certain file by clicking on the “Pause/Resume” or “Cancel” buttons). On the completion, the program will show you a report message that offers you to open the file(s) in a containing folder. Press this button or just quit the application.